Doctor Who first appeared on British TV in 1963 and captured the imagination of audiences until 1989 when it was put “on hiatus” by the BBC. The series was relaunched with great success in 2005 and again has attracted a whole new generation to hide behind the armchairs whilst watching on Saturday evenings, as well as appealing to all the previous generations of fans. The programme about the adventures of a mysterious time-traveller known as “The Doctor”, who explores time and space with his companions, solving problems and righting wrongs. The flexbility of the show allowed the plot to go anywhere and at any time and even for the Doctor to regenerate. 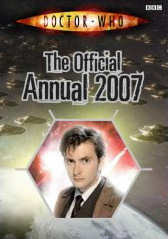 The shows current popularity can be seen with sales of the 2007 Doctor Who annual which has outsold the Beano, selling over 270,000 copies. This is the first time the Beano, has been outsold since the 1940s. For collectors there is a wealth of historical material (Dr Who is now listed in the Guinness Book of World Records as the longest-running science fiction television series in the world) and an abundance of new and varied merchandise. Even during the period when the show was off the air there were numerous licensed media such as novels and audio plays provided new stories, and a film version in 1996. For new viewers there have been two Doctors, but for previous generations there have now been ten Doctors and everyone has their favourite and some collectors specialise in certain Doctors and eras. Some of the most popular areas of collecting are autographs, books and figures. Doctor Who figures have been produced by a number of companies over the years including Mego, Denys Fisher, Palitoy, Dapol and the recent series by Character Options. Character Options have already released three series of figures as well as re-releases of figurines with slight alterations. The Mego toys from the 1970s are sort after especially boxed versions in very good condition – the series included the fourth Doctor Tom Baker, but the associated characters are more valuable such as Leela, K-9 and the Giant Robot. Autographs, signed pictures, signed books and other ephemera are a popular area and there are many collectors who seek not only the main characters but also the lesser known characters. The current series has spawned several spin-off series including Torchwood (an anagram of Doctor Who) and the Sarah Jane Adventures – even more characters to seek out. 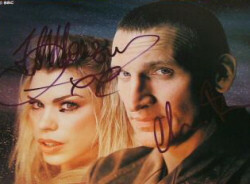 There are a growing number of conventions in the UK and some in the US where collectors can meet characters from the show past and present and receive autographs first hand. Conventions also offer many specialised merchandise stands sometimes featuring rarer items such as original props from the series. A consistant feature over the series has been a never ending collection of enemies and foes, and luckily for the Doctor he has some of the best enemies of all in the Daleks and the Cybermen. 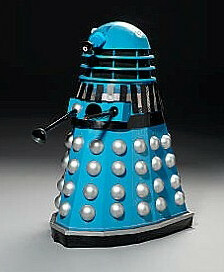 For Dalek collectors the ultimate acquisition was made in 2005 when “The Dalek Supreme” was sold at auction for £36,000 at Bonhams. 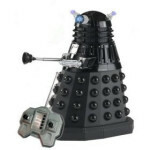 Significantly, this actual model is the King of all Daleks, having starred in period – painted in menacing black and silver livery – as The Dalek Supreme. It was also the Dalek used in the BBC-assisted display at Madame Tussaud’s Waxworks Museum in the 1980 (finished in its current blue and silver) and accompanied the figure of Dr. Who actor, Tom Baker. 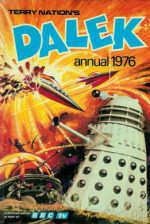 Luckily there are some cheaper Dalek items about including the recently released radio controlled Black Dalek and some older books and annuals which can be picked up relatively cheaply, but expect to pay a premium for older annuals in mint or pristine condition. Doctor Who magazines as well as being a great resource are also collectables as are magazines that feature the Doctor and characters. Some recent editions of the Radio Times featuring Daleks on the cover are already selling for £5. One of the latest concepts to be released is Battles in Time card game and magazine. This is a collectable trading game with a base set of 275 cards including rare, super-rare, ultra-rare cards and the Golden Card. As long as the current series remains popular there should be no shortage of new merchandise. As new fans are attracted to collecting Doctor Who related material, there should be increased interest in the older items. As a rule rare and mint for long term collectability.